Today I ported over my AlbumViewer sample Angular 2.0 application I worked on for a workshop for the last few weeks, to my ASP.NET Core project. I've been building various different kinds of backends for this Angular 2.0 front end app and it's been very easy to simply swap them out by changing the base URL to the API endpoints. I've been working on the Angular 2.0 app on my Mac, but the server side ASP.NET I'm moving it to is running on Windows using ASP.NET Core and so I need to run my API application in a Windows VM on Parallels and access this API from the Mac side where the Angular application is running locally using the WebPack dev server. In order to access the Windows API service from the Mac requires a bit of configuration as by default both Kestrel and IIS Express only serve requests on localhost. Both servers use default bindings that point explicitly at localhost which effectively disables remote access. The issue is that the default binding that Kestrel uses, binds explicitly to localhost. A localhost bound IP won't expose to the external network, so even though you might be able to access other ports on the VM over the network - like IIS running on port 80 - accessing of http://<WindowsVmIp>:5000/ is not supported without some configuration changes. which clearly shows that it's using the localhost URL. In order to expose Kestrel externally you either have to bind to a specific machine name, IP Address or 0.0.0.0 which stands for all IP Addresses (thanks to @DamianEdwards and @BradyMHolt for their help). The key is the .UseUrls() call that applies the host url to the Webhost and as you can see you can apply logic and configuration to decide where the value comes from. Note that you can specify multiple startup URLs separated by semicolons in the string passed. Next you need to make sure that your Windows firewall allows access to the requested port. or you can use the interactive Windows Firewall application. Assuming you used a non-localhost IP address or name, your application should now be externally accessible when you dotnet run. This step is optional, but when developing in a two OS environment I like to make it as easy as possible to identify machines, so I tend to create domain names for the server rather than using an IP address to access it by modifying the HOSTS file on the client machine. 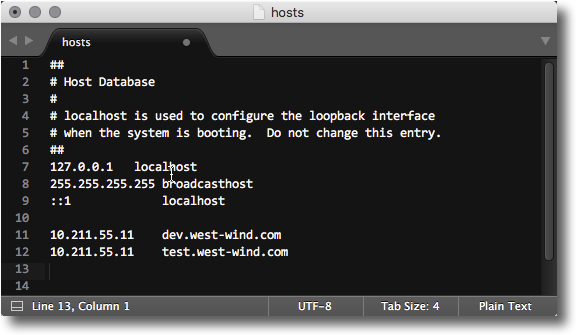 So I have dev.west-wind.com locally which maps to the IP address of my Windows virtual machine in Parallels. to get to my ASP.NET Core application on the Windows VM. Schweet! changing the *:26448:localhost to *:26448:* where 26448 is the IIS Express port. to bind the http.sys entry. and you should be off to the races. I didn't know about the 'http://0.0.0.0' binding to bind to any host with a given port - you can also use 'http://*:5000' which seems to work fine, not sure if there are any subtle differences between them.. I was doing something similar recently. I had to allow a remote user to provide feedback on a project in my Windows machine. I ended up using ngrok, which avoided to provide my IP all the times. This setup seems to involving almost everything required for ngrok and will be enough for testing in a local network. Could you plan a future blog post on setting up nginx for production deployment of an ASP.NET Core site? Thanks Rick for the comprehensive post. In this case it is a tiny change: current versions of Kestrel do not use the "server.urls" parameter but "urls" instead. "Set the --urls command line parameter". @Jose - looks like both are working in Dotnet run tooling 1.0. Its possible add infinite scroll? Great article! How can I do on linux (Ubuntu 16.04)? Thank you. I could not get this to work via command line arguments, it always showed in the console as listening on localhost. I just set this environment variable in my project config Debug tab and it all works. @mikey - you can specify port 80 as the self-host port which will then work without the port in the browser. But you'll likely run into problems as something else (IIS? Skype?) will likely already be using port 80. As for binding to non-localhost URL in Kestrel, why not just modify the applicationUrl in launchSettings.json? @adrian - launchsettings just affects visual studio (and other tooling) launching, not runtime launching.